We perform the task by passing over the lawn with a garden fork, digging it deep into the lawns surface or with a mechanical aerator that will press steel tines of up to 125 mm into the lawn through to the root zone underneath. 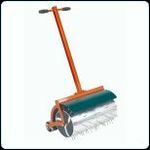 A lawn should be aerated at least once annually. If you dug an area out of your lawn and back filled it with fresh new soil and seeded it, once established that area would always grow lusher and greener than the remaining turf surrounding it. Of course you have introduced new grasses into the renovated area but what is really happening is a change in growth as a result of the fresh air and stimulated microbial activity in the area you dug out. You can simply aerate a lawn area and after a few weeks without having applied fertilisers at all, notice a dramatic increase in colour, growth pattern and density! It can be performed nearly all year round except when dry weather is expected or the ground is frozen. We can perform it in the spring time to to allow soil temperature to rise quickly and to allow the surface to breathe with Solid or Hollow Tines or in late summer/early autumn just before the over seeding of lawn. Mow the lawn really low, ideally the day below and perform the process of Scarification and mow the lawn again to make sure the surface is really clean of debris. When using a mechanical aerator, take care to watch behind the equipment for local lifting of the turf as you go along with the machine and watch out for obstructions like tree roots and rocks and old pathways. Be sure to overlap the wheel footprint. After aerating in a couple of directions, fertilise, and blanket over seed with new grass seed and you could Top Dress with a loam to restore the micro levels. If you have Irrigation Pop Up Sprinklers, insert bamboo canes or markers to identify where there are situated so that the machine tine does not spear the irrigation heads!! Be careful not to turn with the aerator tines in the soil otherwise it will rip up the surface of the lawn. The lawn surface must be firm and not waterlogged and if the lawn is frosty wait until the frost has worn off later in the morning before you start the process. Some aerators have the tines fitted to a drum and others in tine holders fitted to a cam that penetrates the lawn in a very vertically action rather than on an angle like drum aerators. The depth of the latter style of machines is so much better. Aeration is the key to healthy turf and lawns. There is still much to be learnt about aeration and a lot of what is known is hard to prove. What can be said is that most experts agree that opening up the turf surface with machinery of one type or another, is beneficial. Water and air are important to the benefit of the soil eco system and the health and well being of the soil micro-organisms that naturally break down thatch in healthy lawns and root zones. First, it is necessary to maintain good drainage conditions and second, to ensure an adequate amount of air in the topsoil, so grass roots can breathe and grow. By permitting the entry of air into the soil, a gaseous exchange takes place: The grass roots take in oxygen and expel carbon dioxide. Accumulations of carbon dioxide in the soil can considerably restrict root growth and completely prohibit or, at best limit, the intake of water and nutrients. Regularly aerated turf will allow the entry of water. The importance of this is easily seen in summer months, when, during hot, dry weather, it is essential that the uptake of water by the roots is greater than its loss from the grass leaves by transpiration or evaporation. When more water is going out than coming in, browning off can occur and eventually the grass may even die. By thoroughly aerating the area at the browning off stage, the normal intake of moisture by the roots becomes possible again, often without artificial watering, and in less than a week the grasses return to the normal green colour. In a wet autumn and through the winter months, failure to carry out a programme of aeration can lead to an entirely different problem. This is when surface sealing can often occur, due to the compacting effect of trampling feet and heavy maintenance machinery. Once it became clear turf benefited from aeration and percolation, machines were invented and developed to assist the lawn specialist in his work. Most modern units are offered with interchangeable alternative types of tines, and such tines fall generally into three main categories, even though variations may occur in depth, thickness, diameter or shape. There is still a school of thought amongs the numerous Lawn Treatment Companies that the only form of aeration to be performed on a lawn is that of Hollow Tining - the removal of a core from the upper surface of the lawn. The fact that they then leave the extracted cores on the surface of the lawn to naturally rot down is actually keeping the thatch problem the same or actually adding to it! To be technically correct in turf speak, the process of Hollow Tining should be followed up by the removal of the core from the surface and then soil amelioration of the root zone by working in a more desirable soil type, such as a sharp sand to aid drainage. What the majority of lawns in the UK need is simple Solid Tining. SOLID TINES - The round solid tine, though extensively used and useful at times, can, under certain conditions cause compaction in the actual wall of the hole that it produces. There is a general move away from this tine, although it will always be invaluable in dry, hard and severely compacted conditions when penetration with any other shape, to any appreciable depth, is impossible. After using the solid tine several times an alternative tine is often more beneficial. Used regularly, this will avoid the recurrence of compaction. SLITTING OR CHISEL TINES - The slitting tine now tends to be the first choice for general use, since less compaction is evident in the walls of the hole it produces. This hole has a much larger wall area than that produced by the solid tine, and will permit the intake of a greater volume of air and moisture. A further side benefit is that, during its use, a certain amount of root pruning takes place, encouraging new growth along the side and into the depth of the hole. The value of the flat-bladed slitting tine on fairway area is in the deep uncompacted slit that it produces, capable of assisting percolation of a large volume of surface water, very valuable during periods of heavy rainfall. The use of the slitting tine before artificial watering of greens, or before a fertilizer dressing is applied, can ensure the maximum effect by providing access to the root system. This will increase the efficiency of fertilizers and dressings; putting the nutrients down at the roots, rather than leaving them to the elements on the surface, where evaporation and decomposition can occur. HOLLOW TINES - The hollow tine removes a core of soil and is mainly intended to relieve severe compaction, also for getting sand into a heavy soil or loam into a light soil. The cores can be removed and sand or loam brushed or luted into the holes. The aeration value of the hollow tine is less than that of the slitting tine and, if hollow tines are used at the wrong time and in the wrong conditions, a hole can be produced with heavily compacted walls, which take time to break down. Additionally, too much hollow tining can cause the playing surface to become too soft, produce irregularities in levels and encourage invasion of the turf by the wrong grasses and weeds. In England, it is safe to say that hollow tining is generally reserved for cases where the soil had become particularly compacted and is slow draining. Also, where it is necessary to work large quantities of top dressing into the surface for one reason or another. It is fairly common practice in this country, with an 18-hole golf course, to hollow tine six greens each year. In other words, each green is hollow tined only once every three years. Choosing the right conditions for use of tines is very important, particularly the hollow tines. If it is too dry and hard, full depth penetration may well be impossible. If it is too wet, clean ejection of the core may not be possible and if hollow tines become completely filled and tightly packed with soil, it virtually becomes a solid tine of considerably greater diameter. Most manufacturers will confirm that a very high proportion of complaints received in connection with the non-ejection of cores can be put down to its use in the wrong conditions. How deep should I aerate? The depth of penetration is very important. It is not always sufficient simply to open up the surface. If this is done on an area suffering from sub-surface compaction, it can very easily provide conditions that we see all to often these days, where water remains on the surface. The shallow roots have no holding properties on a lawn. So depth of penetration is vital. It is not sufficient simply to penetrate into the compacted layer. One must get beyond it. An existing drainage system can cause problems if the tines hit the pipes and under soil heating presents the same problem on a bigger scale. Machines producing a clean vertical hole without surface disturbance are obviously desirable. This particularly applies on fine turf areas such a golf greens. On the average lawn, some slight disturbance may be acceptable and quickly restored with a light roll from the mower. Some disturbance will always occur on an area being treated for the first few times where root depth is shallow. Ideally what is needed are deep holes, with uncompacted side walls - to get air into the soil, increase the absorption of moisture by roots, encourage quicker and deeper root growth, make the introduction of suitable dressing easier - to produce a turf resistant to drought and wear. As many holes per square metre and all to a depth. Like scarification, aeration is best carried out when the soil is moist. It must be stressed that, if this operation is carried out when conditions are wet, it can have a detrimental effect: The sides of holes will seal up and air and water will not be able to enter the soil. From spring to early summer, 13mm solid tines can be used, penetrating the soil to about 125mm if the machine allows. During the summer, 7-8mm micro solid tines can be used to keep the surface open and to allow nutrients and wetting agents to enter the soil. These tines can be used for seedbed preparation as well. During the autumn and winter months, if conditions are favourable, solid tine aeration can continue, using 13mm solid tines. Hollow tines should only be used during early autumn and middle to late spring. The perimeter of the lawn should be aerated last so as to aerate over your turning area, followed by the bulk of the lawn in two directions such as right angles. Always work in straight lines, although it is not as critical as scarification to keep as straight as possible. Slight turns can be made with tine operation, as the tines are not always in contact with the soil. If possible, it is good practice to aerate before fertilizing and top dressing. Do not aerate during periods of drought as holes can crack open. To check that the desired depth is being achieved, a screwdriver or pencil can be used to measure the depth of the hole. When hollow coring, the machine will leave the cores that have been removed in rows; these will have to be cleared away by hand. Although the machine is relatively thorough at collecting the cores, some will be left scattered over the lawn. The backpack blower can be used to clear away stray cores. Another method would be to run the scarifying machine over all the cores that have been removed and this will break them down, allowing them to be brushed in as an alternative to top dressing (although not as accurate). If the above method is used, the windrow attachment must be removed to allow cores to be spread evenly. The above must only be employed if there is not a serious thatch problem and the soil is of a desirable texture. With increasing levels of use on existing turf surfaces the lawn specialist is not an easy one. Compaction and the problems that go with it: thatch, poor root development and impeded drainage, are well known to lawn specialists, but the budget to deal with them is often a bigger problem! Traditionally the use of the aerator was restricted to spring and autumn, this according to the Sports Turf Research Institute, is only a partial help to the problem of compaction. As play takes place at greater levels during the summer period this is the time of greatest compaction, so it should be a time when aeration is carried out.